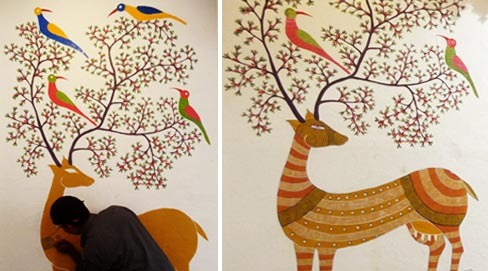 The Gond tribal painting is an experience of art standing at the merger of past and present. A relatively new art form, its roots go as far as history itself. 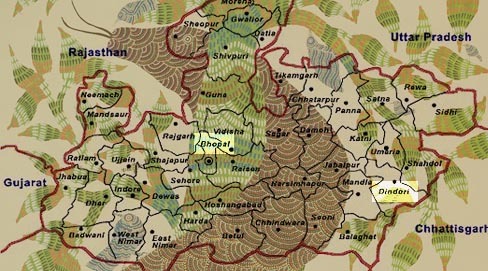 The Gond tribe, one of the largest Adivasi communities of central India resides in Madhya Pradesh and Chhattisgarh. Many years ago the village Patangarh in Dindori district saw a beautiful inter-dependence of the Pardhans and the Gonds. The Pardhans were priests and storytellers responsible for carrying on the traditions and history of the Gonds through songs and rituals. They would invoke the god Bada Dev at the Saja tree by playing the musical instrument, the Bana and record the Gond patrons’ genealogy in song. In return, they would be offered gifts of grain, clothes and maybe even cattle or gold. 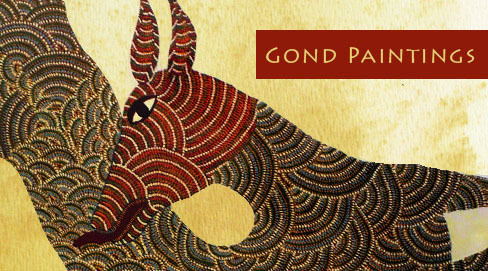 Time and influences changed the social order, and dwindling patronship of the Gonds to the Pardhans made them look for sources of livelihood for the first time. Some became labourers while some did odd jobs for farmers. The songs of praises of the Gonds were lost and a young Jangarh Singh Shyam started filling the silences with pictures in sand. 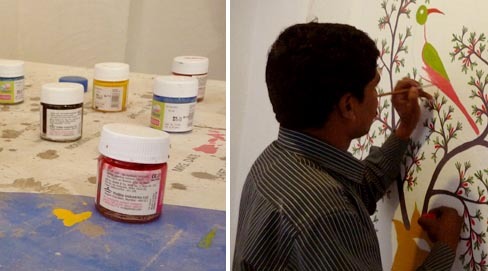 His first painting, a yellow mud rendering of Hanuman, soon brought him to Bhopal, under the connoisseur eyes of the renowned artist, Jagdish Swaminathan. 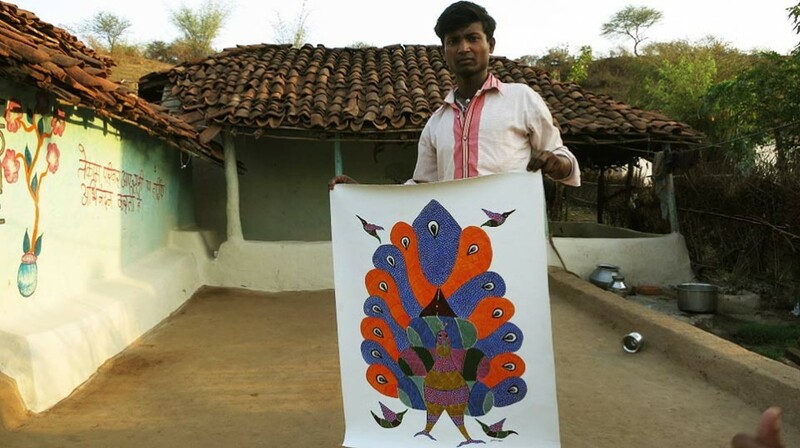 Slowly, the lives of many Pardhans went through a transformation as they took to this new art of painting stories of their lives with colours of the city and patterns of the village. Paper and canvas are the new media of storytelling for the painters. A rough pencil outline first forms the premise for the visual narratives. Once bright acrylic colours have filled the canvas with flat expanses, small patterns evocative of tattoos worn by the womenfolk begin to emerge. 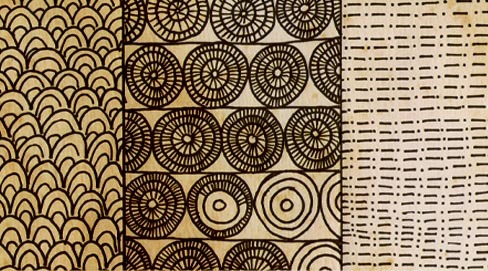 Like undulations of song, like fables within tales, colourful dots and lines chase each other in close succession. Immense patience and delicate brush strokes are part of the meditative process, as if reminiscing the days past. Nature is and always will be loved on the canvas, as tigers, deer, snakes, cattle and birds merge with each other and with contorting trees on the seemingly psychedelic representations. Seemingly so, because the songs that spoke about the vivid characters, the deities and demons, have almost been silenced and the colours try to break out of the canvas to tell the beholder what a wonder mother nature is. Jangarh Singh Shyam departed from the world suddenly, but the legacy created by him gives hopes of keeping the memories of the tribe alive.Jangarh Kalam, as the art is known now, tells the world imageries and songs written in colour and texture by the Pardhans, the story keepers of the Gonds. 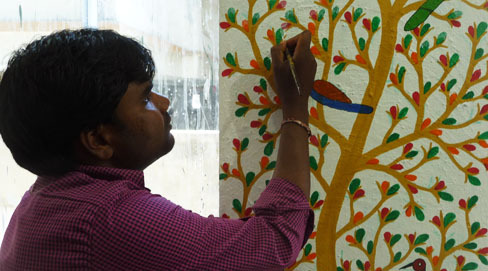 Every Gond painter has developed his or her own style now, some draw circles, while some draw lines, some use myriad colours, while some stick to black and white. Gond women beautify themselves with tattoos, their homes with coloured mud paintings, or Digna; art permeates every aspect of life. And now the art has materialized from the imagination of the village dweller’s mind to the galleries of Metropolises, conversing with the works of modern artists. Every art is a tinted reflection of another, and they all are children of the earth, born as we try to give tangibility to nature’s mysteries and forces. i want gond art in words can you give me.